BEST SELLER - MICHTOY RECOMMENDED! The Rust-Oleum 12 oz. 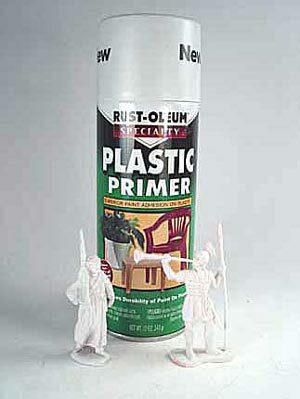 Specialty Plastic Primer Spray can be applied directly to a variety of plastics and offers superior paint adhesion on all types of plastics, perfect for use on soft plastic figures. The primer dries to a matte white finish and can be followed with any topcoat. The oil-based formula dries in as little as 20 minutes and can cover an area of up to 15 sq. ft.